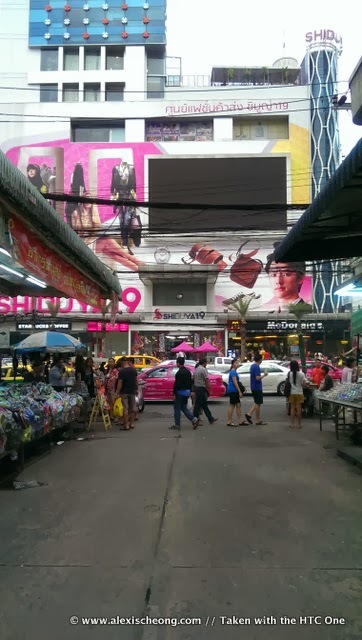 I think I've been to BKK at least once a year for the past few years. Still, it is a great city which I love going back to only because it has two of my favorite things - cheap clothes and street food. So I made an impulsive booking a few weeks back to go to BKK with a few of my primary school friends (I know, it's amazing that we kept in touch, but we're awesome like that). I also decided to take with me my brand new HTC One phone to document the trip because I was given the phone to review and try, and thought the trip would be perfect to try out the camera functions! 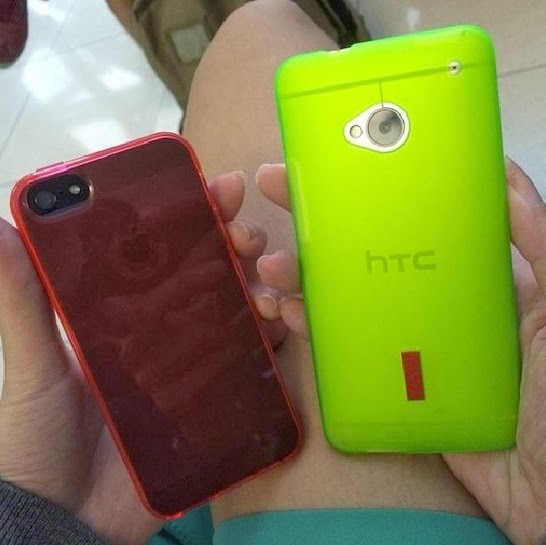 As a result I was using the hashtags #alexisrunsbkk and taken with the #htcOne on all my instagram postings and all photos in this blog series is taken with the HTC One. Anyway! 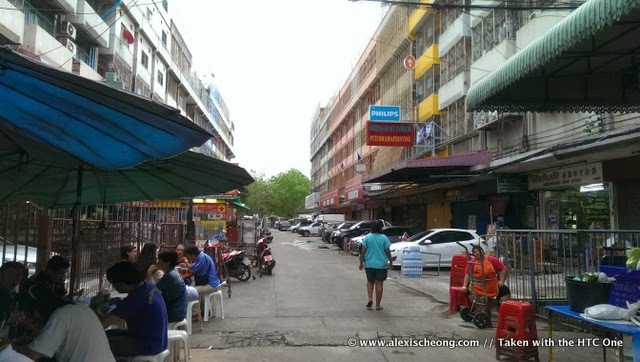 The reason why I am blogging about BKK is because we did a very impressive coverage of the city this time round and I wanted to share the 4D3N itinerary with you guys. 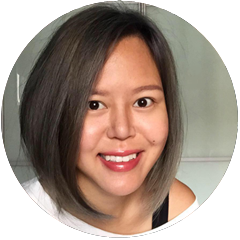 Where would jaded Singaporeans go when they go to Bangkok? I shall attempt to answer it in a 3-part series. Now let's get to the actual itinerary itself. 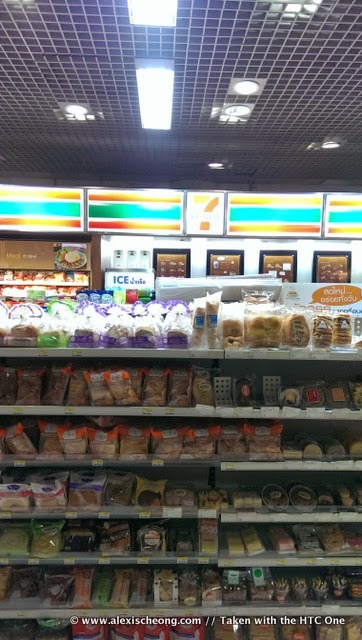 In short Day 1 was Airport - Tailor - Platinum Mall - Jae Koy dinner - Rachethewi night market - Route66 - Sukhumvit Soi 11 - Hotel. 1. 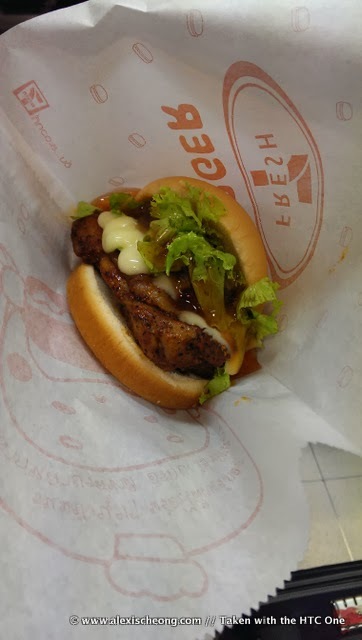 Upon airport arrival, you NEED to head to the basement's 7-11 for their black pepper chicken burger, which you can order from a menu at the counter and the staff will prepare it for you. It is super delicious and the perfect snack to tide you till you reach the city. Then to get a tourist SIM card for 300 baht. 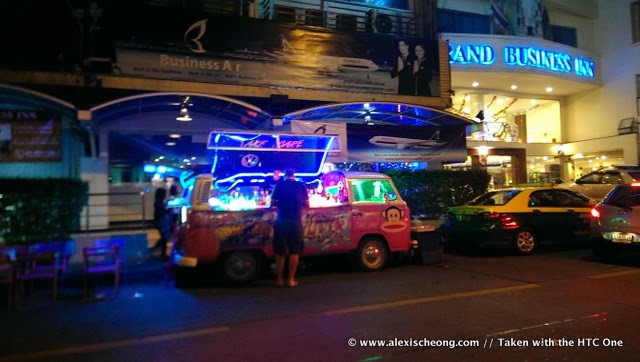 Took a 20min taxi ride to our accommodation at Bangkok City Hotel at Rachethewi area. Not too bad - clean, functional and spacious. 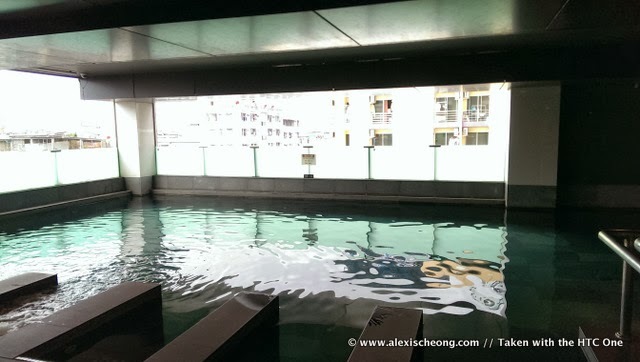 Comes with an indoor swimming pool on the 5th floor that is NOT heated. It costed about S$80 for 3 nights. Upon reaching the hotel and having settled in, it's time to leave and head to the tailor to get some shirts made! However, on the way there we got distracted by a roadside stall just opposite Shibuya 19. This is how it looks when you turn right. 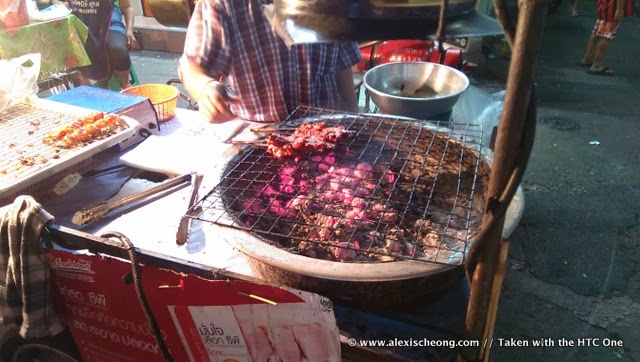 Bought some street pork satay back to where we sat. 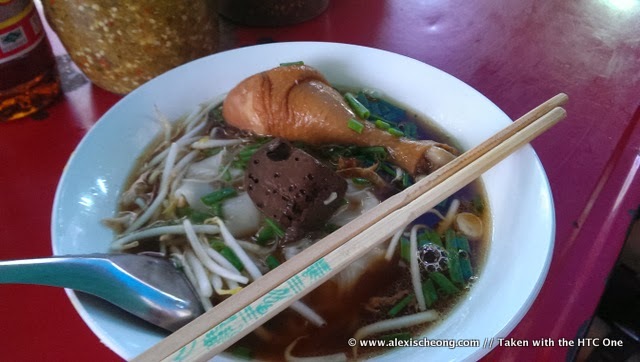 We ordered two bowls of chicken drumstick noodles with pig's blood and slurped it all up. 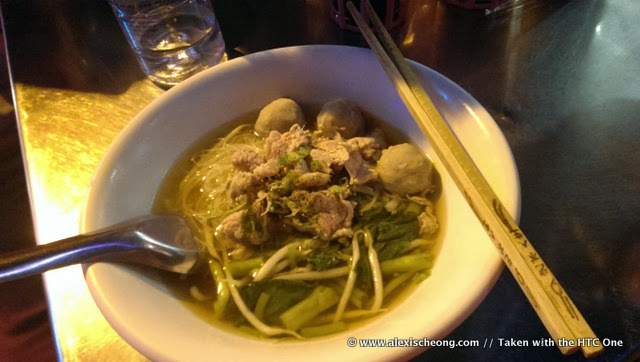 What I also realized is that Thai noodles are actually pretty similar to the Vietnamese pho - the difference lies in the group of fish sauce, two types of chili and sugar that they have at every table. 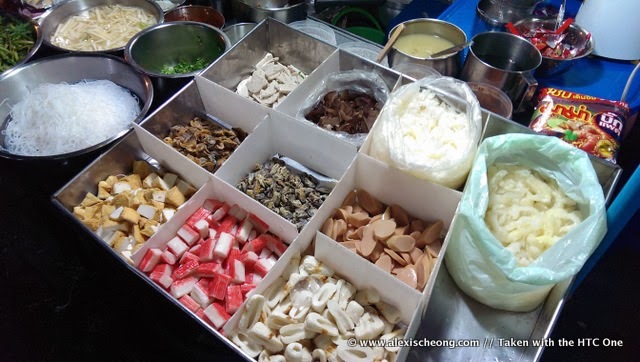 With these 4 magic ingredients, you get to customize your very own noodles. 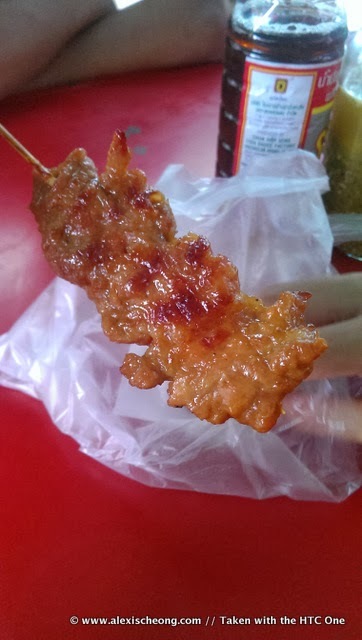 I thought that is really something rather unique, and distinctive to thai street food. 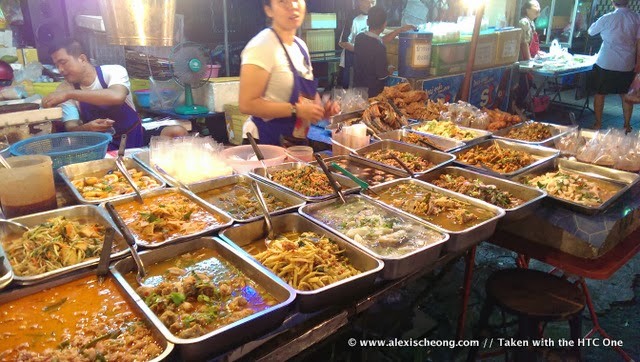 The roadside food culture is very strong in Bangkok. 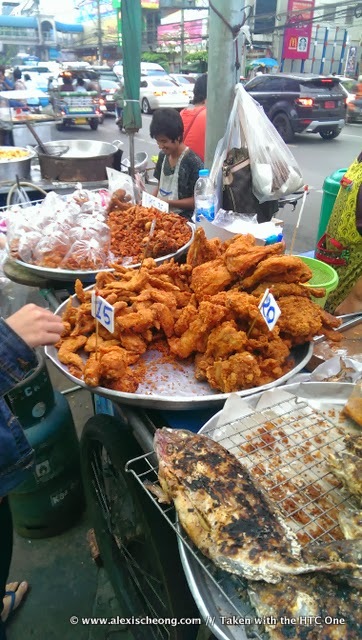 For example, the fried chicken is quite common, though these were HUGE! (also outside Shibuya mall). 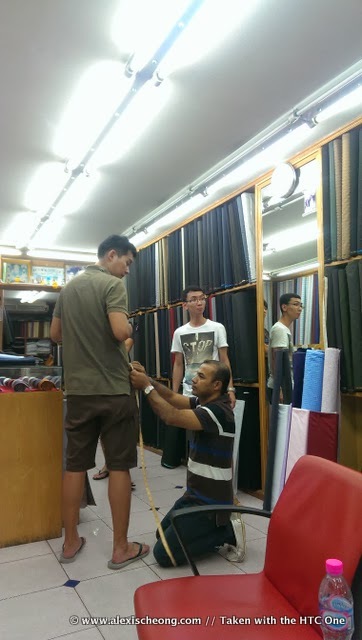 Here's the tailor for my 3 dear male friends. 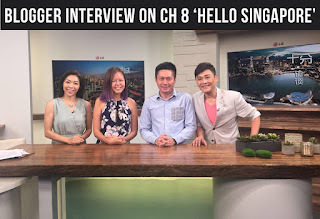 The guys are all very happy with the quality and price of the tailored shirts (its about $23 per shirt, and you get to choose fabric even for the collar and cuffs! I'll get the address for you guys in a bit. It's in the Pratunam area. After measuring, we went to Platinum Mall for some quick shopping, before heading to dinner because the shops started closing at 7pm (on a Saturday night!). For those uninitiated, Platinum Mall is the wholesale mall where every blogshop gets their goods from, though in recent times it seems like the wholesalers are getting lesser (through my anecdoctal comparison). 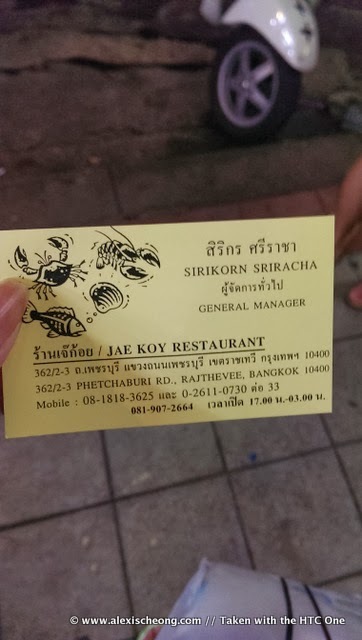 Dinner at Jae Koy Restaurant was really good. 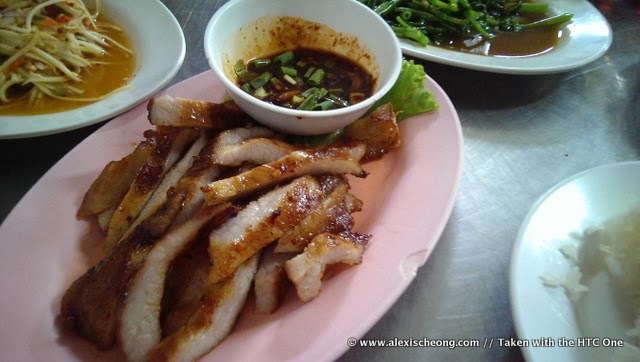 It was just beside our hotel and they served up really good zi char, Thai-style. 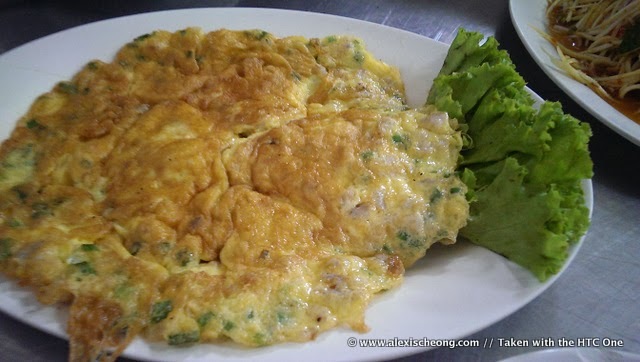 You have the classic omelette (rather plain). 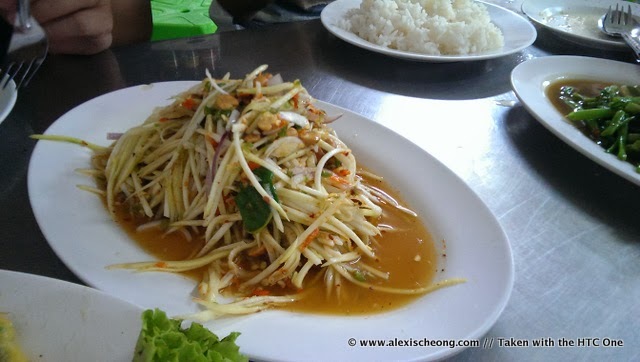 The super fiery mango salad. It was so spicy! 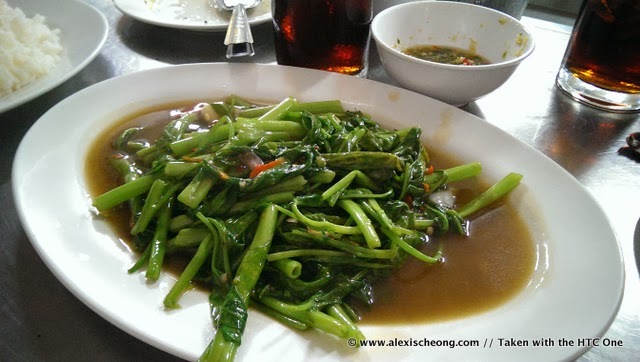 Some kang kong. We had a bit of trouble ordering this until we could find a picture on the menu to point at. Highlight of the meal was the pork belly - it was just mind-blowing. Best dish hands down. Must order. In fact, this dish alone is enough for me to go back. 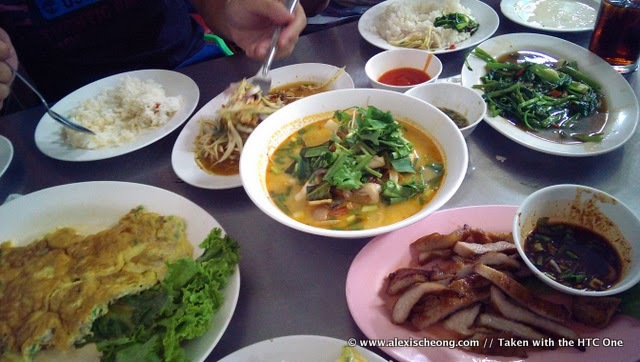 For all that we ordered, included a big bowl of tom yam seafood soup, it costed.. about S$6.50 per person. We ate like kings. Paid next to nothing! See what I mean about good and cheap stuff? After we filled our tummies, we went back to the hotel to put down our shopping, and then its out to explore, because its still early! We walked to the street just further down of the hotel. 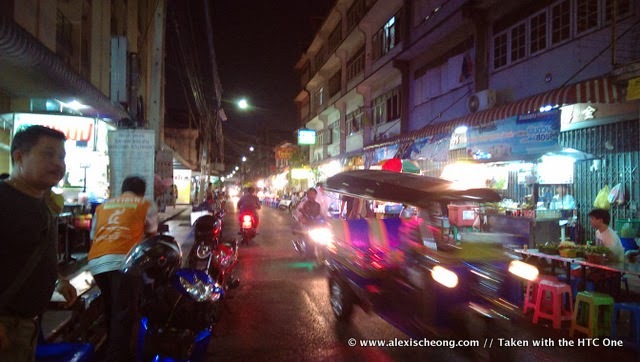 It was a really busy side street/area bustling with locals. 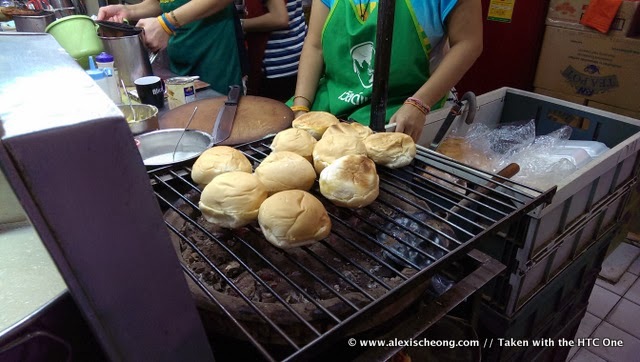 We saw a stall selling buns/Thai iced tea and coffee and made a mental note to head there for breakfast the next morning (the hotel breakfast was disappointing). 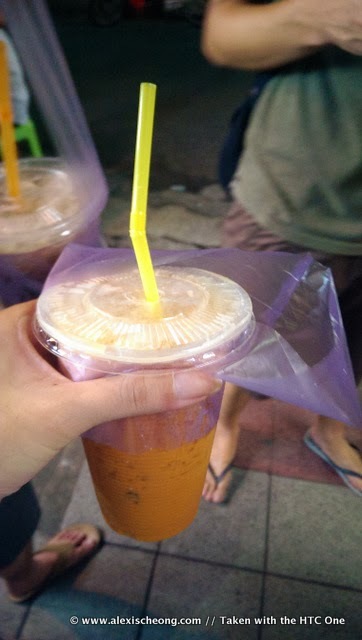 We had to get our Thai iced tea fix. Cy said he wanted to brush his teeth with thai iced tea. 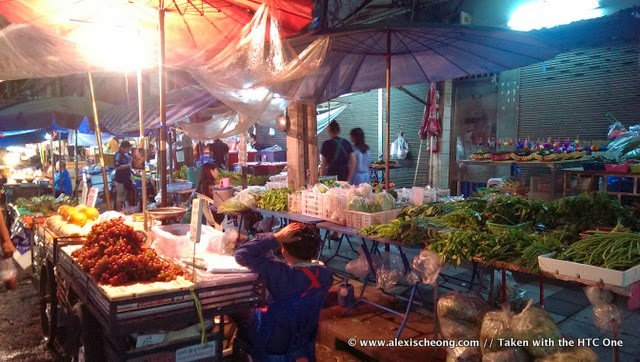 Walking further in, we discovered that the area seemed like a wet market of sorts for locals. 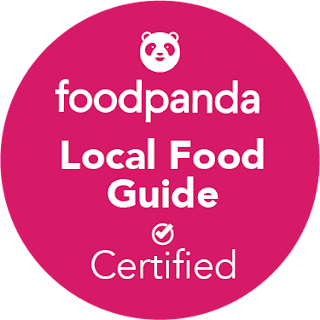 Other than raw food, there's also food stalls, including some thai-style nasi padang, or what my friend calls, point point rice. If I had stomach space I would totally order some rice (in a plastic bag) and put some authentic basil pork in it! 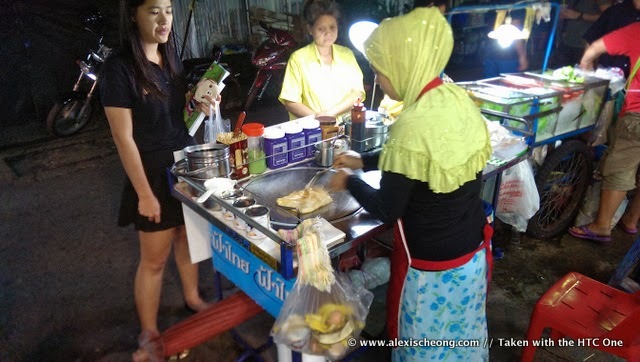 They are also unabashed when it comes to using processed foodstuff to sell as street food. You just gotta heat them up! There were rows of shophouses on each side. Barbequed meat looked really good too. Damnit, why no stomach space? And this! 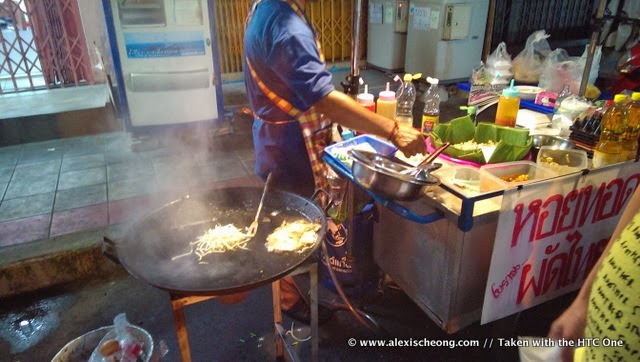 One of my favorites everytime I visit Bangkok - the crispy prata with chocolate and banana. It's a seriously odd streetside food to have, but absolutely divine. The last stall we saw had a guy making orh luak! Again, *drooled*. It looked so good. 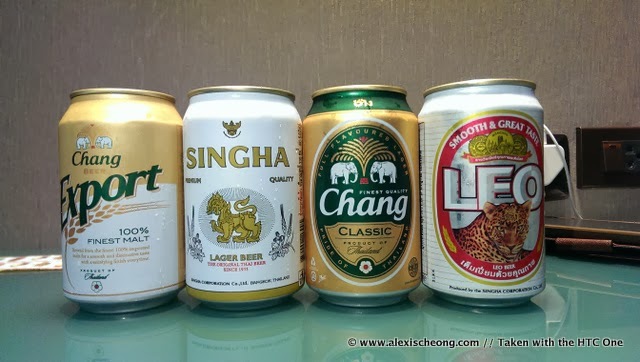 Next we bought some beers at 7-11 for tasting because we couldn't decide which local beer to choose. IMO Chang classic was the best of the lot (chang export was 2nd). 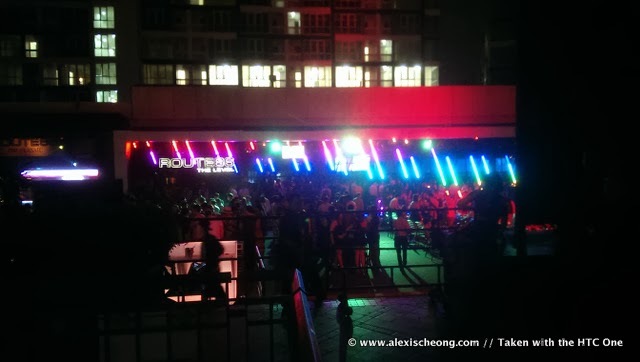 Then it's out again for clubbing at Route66, Bangkok's most famous club. It's half open area, made of 3 'rooms', and one of the 3 big clubs at RCA. 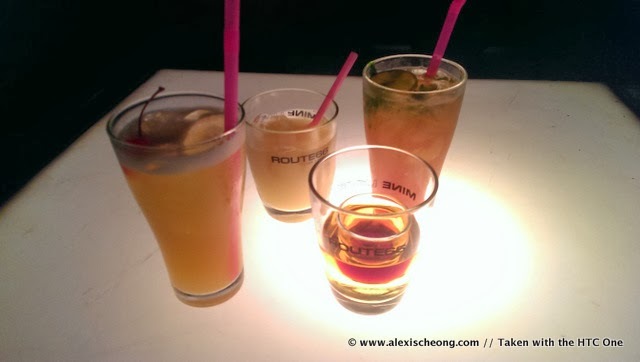 Drinks were 400 baht each. You need to buy drink coupons upon entry (min. 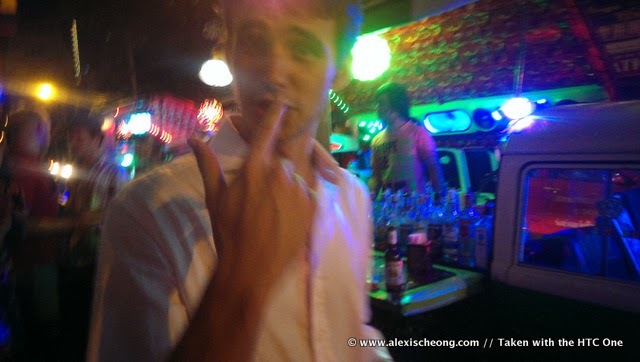 600 baht per pax) but cash is ok after finishing the coupons. 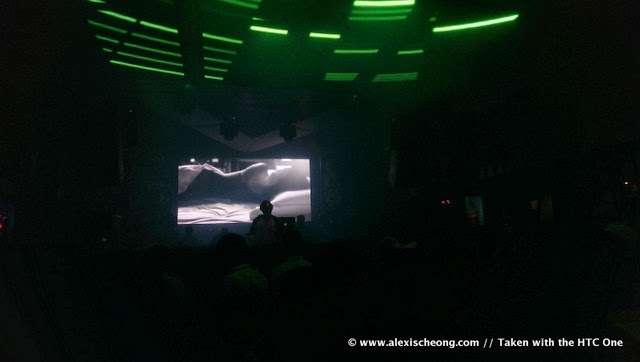 Awesome DJ and sound so loud, you really can go deaf. 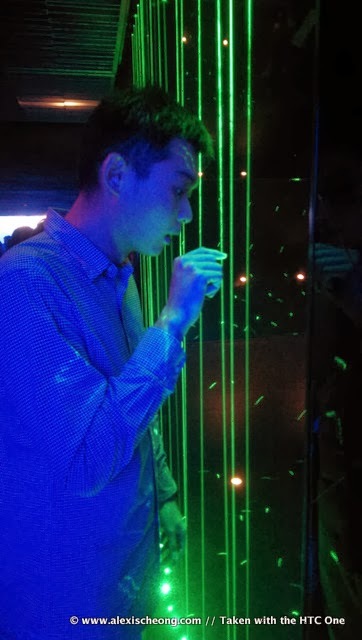 Cool laser lights at the entrance of one of the rooms (there are 3). 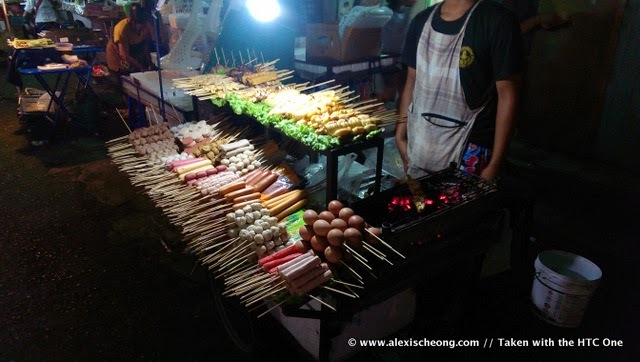 Outside the mega clubs you will find a row of night stalls selling finger food and even noodles. Best thing to have after clubbing's probably fried chicken. You can never have enough fried chicken. 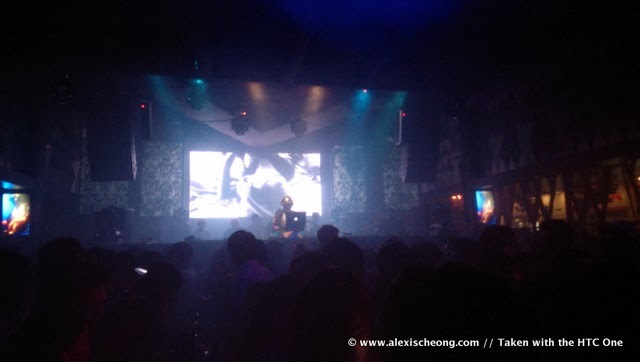 Next, night was still young so we decided to go to Sukhumvit Soi 11 after that to check out the night scene since Bed Supper Club is there. 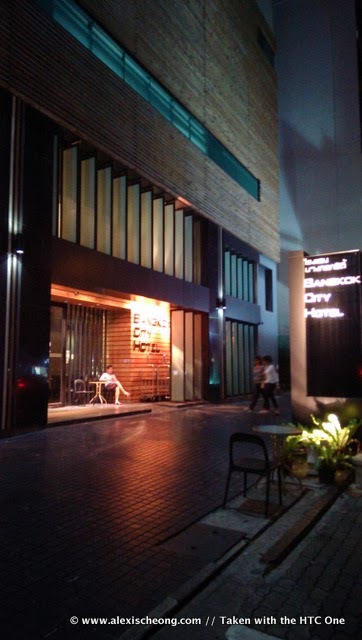 It's also where the great hostel Suk11 is. 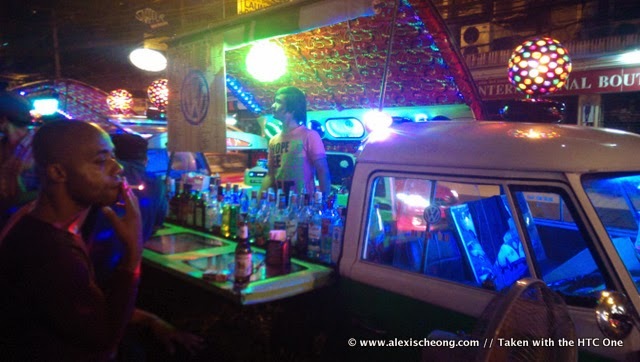 There are tonnes of these pop-up mobile bars that appear at night there, disappearing in the morning. 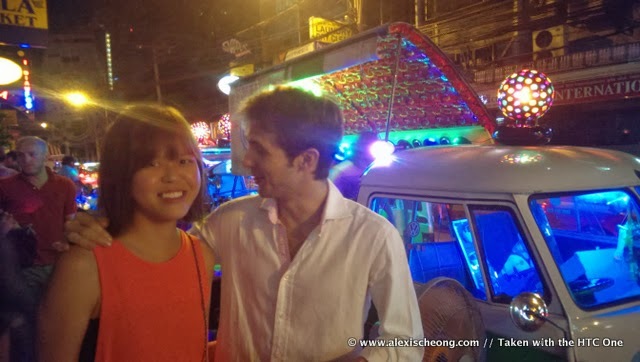 A cute french guy thought I wanted to take a photo with him. So I did. I was a bit shy though. 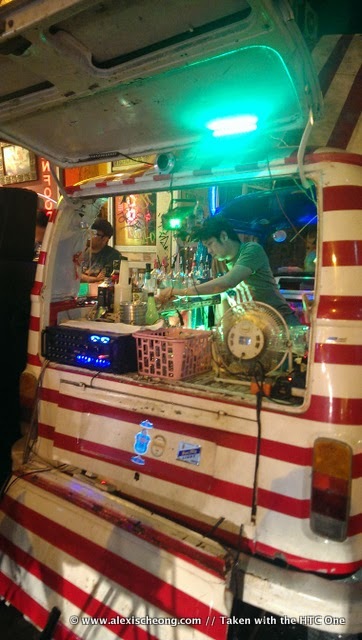 The mobile bars were super cool! I wish we could have a street like this in SIngapore! Lastly we finished off the night with a comforting bowl of beef noodles by the roadside before hailing a cab back to the hotel. By the time I slept it was 4am. Wow. I've not stayed up so late before for a while. Hi Alexis, What is the address of the tailor shop that you went to? 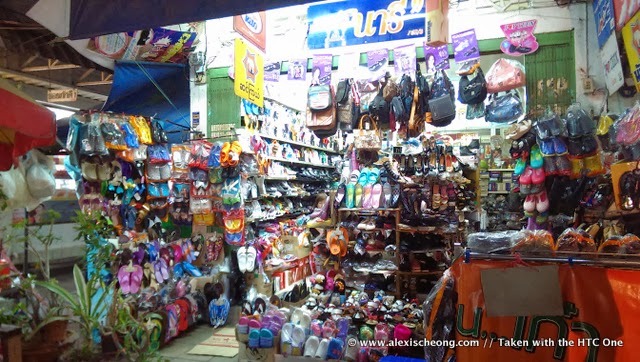 The bangkok tailor in the above picture looks like having wide varieties of clothes with good quality. As you mentioned, the price of tailored shirt is also affordable. Its an average price and everyone can spend it for a good quality shirt. 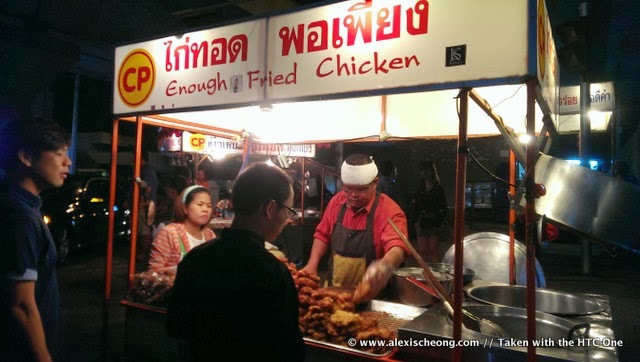 Great post, I love the pics, the chicken cart outside RCA is by far the best check in Bangkok! cant believe we did so much in one day! 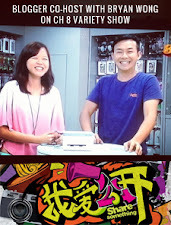 Hi Alexis, do u still remember the Watergate collection tailor shops is near which hotel or prominent building in pratunum?